The best walking shoes for travel are also comfortable beach shoes built for water aerobics and walking - they're Viakix Casual Water Shoes! Finding the right women's shoes can be difficult, especially when you live an active lifestyle. Most aqua shoes don't have enough support for walking and are just for being around water, yet running shoes are uncomfortable when wet. With Viakix Casual Water Shoes, you can enjoy the best of all worlds in one versatile, comfortable women's shoe. 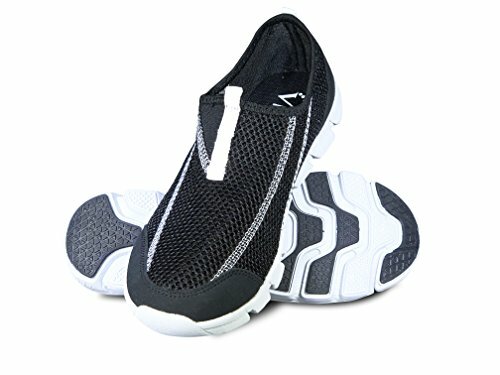 Considered the best beach shoes, water aerobics shoes and all-around travel shoe, Viakix Casual Water Shoes give you the mobility and comfort you need to transition quickly between home, the gym and your daily adventure, all without changing your shoes. So whether you're looking for the perfect water shoes, or just need shoes for day-to-day errands and having fun, you can have it all. We want you to experience the full comfort of our Viakix shoes and sandals. To get the best fit, measure your foot from heel to toe and use the measurement guide below to choose the right shoe size for you. Please note that our shoes run slightly wide. Give yourself a cute pair of the best water shoes and make every adventure more fun; click 'Add to Cart' now to get yours! COMPLETE VERSITILITY: Our highly-versatile, stylish swim sneaker will help you look great while out shopping or during your next aquatic adventure. Viakix are the only water shoes that provide the mobility and comfort you need to transition quickly between the beach and your daily adventure, all without changing your shoes. EXCEPTIONAL QUALITY: We build our water shoes and sandals from the bottom up and always use high quality outsoles to ensure that you have enough support and comfort, without sacrificing the durability you need for any exercise, whether you are walking, ocean kayaking, swimming, boating or during your water aerobics class. EASY TO WEAR: Our water shoes for women features enhanced cushioned insoles for extended wear while in water or on dry land. These sneakers are easy to slip on and off to let your feet breathe, and are the perfect companion while traveling. QUICK DRYING MESH: Unlike standard womens beach shoes and sandals, these mesh aqua shoes dry more quickly and efficiently to help reduce irritation and moisture by keeping a dry, healthy foot environment. DURABLE SOLE: Viakix ladies sneakers feature a soft, thick, but flexible rubber sole that provides the best foot comfort when walking on a variety of surfaces. If you have any questions about this product by Viakix, contact us by completing and submitting the form below. If you are looking for a specif part number, please include it with your message.